Seeing that we live, well, in the middle of nowhere in New Hampshire, we’re always driving South for the day, either to the Manchester area, or to Boston. Often, we’re stopping for breakfast, and we do have some regular favorites, like the Foothills in Warner (which, wow, still haven’t reviewed them…), or the Red Arrow. But after a while we do tire of the same places all the time, so I’m always keeping my eye open for new places along the I-89/I-293/I-93 drive. One place that recently landed on our radar was the Purple Finch Cafe in Bedford, since the Hippo listed them in a recent article on the Top 25 Local Breakfast Restaurants. so on our way to Boston two weekends ago, we decided to stop and try them out. 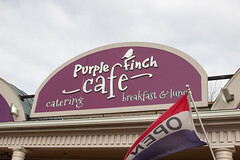 Despite opening in early 2012, Purple Finch hadn’t really shown up on my radar, since it’s tucked into a pretty obscure little location, in a little strip mall/office park nestled between Route 3 and Route 101 in Bedford, and it’s not really visible from the road. But turning into the mall, you could tell that this place was on a lot of people’s radar, since the parking lot was full on a Saturday morning at 9am, despite none of the other places being open. Indeed, walking into Purple Finch, there was a healthy line of people waiting for tables, but they seemed to be cycling through quickly. We grabbed some complimentary coffee while we waited, but we found ourselves called by the hostess in just a few minutes. 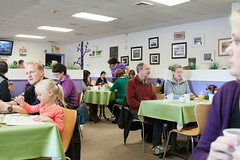 Purple Finch has a somewhat odd decor: I’m not particularly used to places being decorated in bright greens and purples. But once you get past that, it’s actually a pretty comfortable place, and quite hopping on a Saturday morning. Settling into our table, we started looking over the menu. The main attraction seems to be Benedicts (indeed, I almost ordered their “Grill-Billy” CBH Benedict), but they’ve got quite the breakfast and lunch menu, with sandwiches, pancakes, waffles, and the like. After perusing the menu, Carol settled on one of their specials (the Bruschetta Benedict) while I opted to try one of their more unusual specials: the Bird’s Nest (with hashbrowns and eggs). And then the waitress talked us into trying the sweet potato donuts as well. The donuts came out first, and were a great start to things. These were the perfect combination of tender interior and crispy exterior. 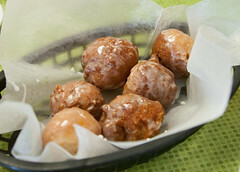 The interior had a particularly nice spiced sweet potato flavor, and the glaze didn’t overwhelm the donuts. These were great, and I’d get them again in a heartbeat. Next was my Bird’s Nest. 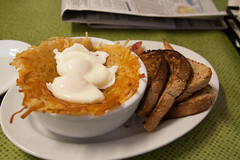 One of the house specialties of Purple Finch, the Bird’s Nest is basically a bowl full of hash browns with eggs nested inside. Normally, this dish wouldn’t excite me this much, but after taking one bite of it, I made a realization: the attraction here is that Purple Finch makes some of the best hashbrowns in the state. New Hampshire generally isn’t hashbrown territory (this is mostly homefries country), and most places that do hashbrowns don’t do a particularly good job of them (one notable exception is the excellent hashbrowns over the river at the above-mentioned Red Arrow). But the hashbrowns here are quite good, in fact, they remind me pleasantly of the famous hashbrowns of Waffle House (and that’s high praise indeed). 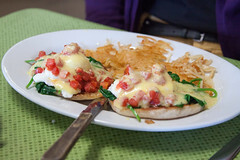 Carol did quite well with her breakfast as well: a Benedict make up Bruschetta style, with basil, spinach, garlic, and chopped tomatoes. Oh, and a side of those wonderful hashbrowns. And a reasonably good hollandaise sauce. While I liked my bird’s nest, I think next time I’ll try one of their Benedicts instead, perhaps the Grill-Billy with corned beef hash. Overall, we were really pleased with the Purple Finch. The food is quite good, rather affordable, and it’s actually fairly conveniently located by our travels, and adds a pleasant non-chain option to Bedford, which otherwise is mostly strip malls and chain food. I’ll be coming back more than once.